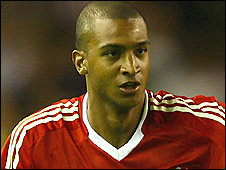 Liverpool striker David Ngog produced a clinical finish to help the Reds come through a testing Carling Cup third-round tie at Leeds. Ngog controlled an attempted shot by Javier Mascherano before spinning and sidefooting past keeper Shane Higgs. It was the kind of finish Leeds striker Jermaine Beckford lacked as he mishit an earlier shot when through on goal. Beckford was also harshly deemed offside when Leeds had an early Lubomir Michalik headed effort disallowed. It was a contentious call by the assistant referee as Beckford looked onside, while also not appearing to get a touch as Michalik's low header found its way past flailing keeper Diego Cavalieri. The decision may leave Leeds with a rueful feeling of an opportunity lost, especially against a lacklustre Liverpool side, but they can take encouragement from a determined performance. A tough challenge was expected from Leeds after 15 league home wins on the trot, their good form pitted against the desire of Liverpool's fringe players trying to impress manager Rafael Benitez. A roaring full house was also in the home side's corner and provided a flashback to recent halcyon days at Elland Road, which included a Champions League semi-final against Valencia in 2001. And Leeds should have given their contingent of the sell-out crowd a goal to cheer early on but an unmarked Michael Doyle headed an inviting Robert Snodgrass cross disappointingly wide. 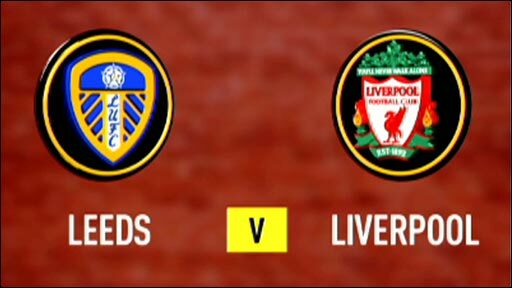 Michalik's header was then disallowed as Leeds pushed forward, sensing an upset against an unfamiliar looking Liverpool struggling for any rhythm or control. Benitez had made nine changes to his starting line-up and it told in their play with Ryan Babel ending a marauding run with a tame shot to give them a rare threat on goal. Liverpool's second string were doing little to enhance their cases for more of a first-team say as Leeds were the more accomplished, with Snodgrass, in particular, causing Reds left-back Andrea Dossena all sorts of problems. Leeds were given a major scare when Albert Riera flicked a header goalwards from close range but keeper Higgs pulled off an instinctive save before Luciano Becchio blocked the Spaniard's follow-up. Beckford has earned a reputation as a prolific striker in League One and was aiming to enhance his reputation against more exalted opposition. He had an ideal chance when he was through on goal after running on to a long ball but he mistimed his shot and Cavalieri gratefully saved. Beckford did show his instinctive nature in front of goal when a Bradley Johnson cross was just behind him and he hooked an effort on goal agonisingly high. Liverpool were hardly convincing and Mascherano could have been given more than a telling off for striking out at Beckford as the visitors' frustration came to the fore. But the tireless Ngog capitalised on the home side's failure to score with his goal before the Reds closed out the game to progress into the last 16. "I felt Jermaine was level for the goal (we had disallowed) but we are talking marginal errors at times. "I'm loathed to criticise but when you look he was level and the goal should have stood. "We certainly matched them and on another night we might have got the victory our performance deserved." "It was a great goal (by Ngog). He showed quality, very good movement. He was also fighting big lads, so I think he had a very positive game. "We won with a lot of players not playing and I am really pleased with my team, with the squad. "These kind of games are very important to keep the quality of character. I think it was a fantastic win for us." 90:00+4:38 The referee ends the match. 90:00+2:47 Drilled right-footed shot by Steven Gerrard. Save by Shane Higgs. 90:00+2:04 Short corner taken by Fabio Aurelio. 90:00+1:27 Bradley Johnson challenges Javier Mascherano unfairly and gives away a free kick. Glen Johnson takes the direct free kick. 90:00+0:30 Enoch Showunmi challenges Sotirios Kyrgiakos unfairly and gives away a free kick. Jamie Carragher takes the direct free kick. 89:51 Substitution Ryan Babel leaves the field to be replaced by Martin Skrtel. 89:41 Steven Gerrard produces a left-footed shot from deep inside the area which goes wide of the left-hand post. 88:32 Mike Grella has an effort at goal from the edge of the area that misses to the right of the target. 87:50 Substitution Enoch Showunmi joins the action as a substitute, replacing Michael Doyle. 87:50 Shot on goal by Ryan Babel from just inside the area clears the crossbar. 87:27 The ball is delivered by Bradley Johnson, Glen Johnson manages to make a clearance. 84:09 Patrick Kisnorbo gives away a free kick for an unfair challenge on Ryan Babel. Fabio Aurelio has an effort direct from the free kick, Jason Crowe gets a block in. Outswinging corner taken from the left by-line by Fabio Aurelio, Jason Crowe manages to make a clearance. 83:25 The ball is crossed by Jason Crowe, clearance by Javier Mascherano. 82:31 Unfair challenge on Albert Riera by Michael Doyle results in a free kick. Jamie Carragher takes the free kick. 80:11 Substitution Mike Grella comes on in place of Luciano Becchio. 79:25 The ball is swung over by Andrea Dossena, clearance by Lubomir Michalik. 77:32 Substitution Andy Hughes goes off and Neil Kilkenny comes on. 77:32 Substitution Steven Gerrard joins the action as a substitute, replacing David Ngog. 76:03 Jermaine Beckford challenges Sotirios Kyrgiakos unfairly and gives away a free kick. Diego Cavalieri takes the free kick. 75:25 Bradley Johnson takes a shot. Diego Cavalieri makes a save. 73:32 Free kick awarded for a foul by David Ngog on Lubomir Michalik. Patrick Kisnorbo crosses the ball from the free kick right-footed from own half. 71:59 Unfair challenge on Fabio Aurelio by Robert Snodgrass results in a free kick. Jamie Carragher restarts play with the free kick. 70:58 Substitution Philipp Degen goes off and Glen Johnson comes on. 69:45 Unfair challenge on Ryan Babel by Jonathan Howson results in a free kick. Diego Cavalieri takes the direct free kick. 69:31 The ball is delivered by Bradley Johnson, clearance by Sotirios Kyrgiakos. 68:50 Philipp Degen crosses the ball, Jason Crowe manages to make a clearance. 68:19 Ryan Babel is ruled offside. Shane Higgs takes the indirect free kick. 67:30 David Ngog is ruled offside. Free kick taken by Shane Higgs. 66:44 Handball decision goes against Philipp Degen. Shane Higgs restarts play with the free kick. 65:08 Assist by Javier Mascherano. 65:08 GOAL - David Ngog:Leeds United 0 - 1 Liverpool David Ngog grabs a goal from inside the box to the bottom left corner of the goal. Leeds 0-1 Liverpool. 64:46 Albert Riera decides to take the corner short. 63:42 David Ngog challenges Patrick Kisnorbo unfairly and gives away a free kick. The free kick is delivered right-footed by Patrick Kisnorbo from own half. 63:02 Jermaine Beckford produces a right-footed shot from inside the area that clears the crossbar. 60:50 Long range shot by Javier Mascherano goes wide left of the goal. 56:40 Michael Doyle takes a shot from just outside the penalty area which clears the crossbar. 55:42 Javier Mascherano concedes a free kick for a foul on Robert Snodgrass. Free kick crossed left-footed by Robert Snodgrass, Albert Riera makes a clearance. 55:30 Albert Riera takes a shot. Lubomir Michalik gets a block in. 55:10 Jonathan Howson takes a shot. Sotirios Kyrgiakos gets a block in. 54:44 Ryan Babel challenges Michael Doyle unfairly and gives away a free kick. Shane Higgs takes the direct free kick. 53:33 Jermaine Beckford takes a shot. Save by Diego Cavalieri. 52:54 Patrick Kisnorbo concedes a free kick for a foul on David Ngog. Free kick taken by Jamie Carragher. 52:12 Ryan Babel delivers the ball, Jay Spearing produces a right-footed shot from just outside the area that goes harmlessly over the target. 51:27 Inswinging corner taken left-footed by Fabio Aurelio from the right by-line, Lubomir Michalik makes a clearance. 48:22 Bradley Johnson concedes a free kick for a foul on Jamie Carragher. Diego Cavalieri takes the free kick. 47:38 The ball is delivered by Philipp Degen, clearance made by Patrick Kisnorbo. 47:25 Free kick awarded for a foul by Patrick Kisnorbo on David Ngog. Free kick taken by Fabio Aurelio. 46:56 Luciano Becchio produces a left-footed shot from just outside the box that goes wide left of the goal. 45:00+1:08 The ref blows to end the first period. 45:00+0:06 The ball is delivered by Ryan Babel, Bradley Johnson makes a clearance. 43:32 Inswinging corner taken by Fabio Aurelio from the right by-line, Lubomir Michalik makes a clearance. 42:30 The ball is crossed by Fabio Aurelio, Albert Riera takes a shot. Save by Shane Higgs. 42:30 Booking Jason Crowe goes into the book. 42:25 Jason Crowe gives away a free kick for an unfair challenge on David Ngog. 40:33 Jason Crowe takes the direct free kick. 40:33 Booking Sotirios Kyrgiakos is given a yellow card. 40:27 Foul by Sotirios Kyrgiakos on Luciano Becchio, free kick awarded. 40:17 Centre by Albert Riera, Jason Crowe makes a clearance. 38:53 Foul by Javier Mascherano on Luciano Becchio, free kick awarded. Free kick taken by Patrick Kisnorbo. 38:13 Jay Spearing has an effort at goal from 25 yards. Lubomir Michalik gets a block in. 37:33 The ball is swung over by Robert Snodgrass. 35:57 Robert Snodgrass challenges Albert Riera unfairly and gives away a free kick. The free kick is delivered left-footed by Fabio Aurelio from left channel. 35:06 The ball is swung over by Jason Crowe. 33:18 Albert Riera takes a shot. Blocked by Patrick Kisnorbo. 31:27 The ball is delivered by Robert Snodgrass, save by Diego Cavalieri. 30:36 Unfair challenge on Andy Hughes by Ryan Babel results in a free kick. Shane Higgs takes the direct free kick. 29:24 Ryan Babel takes a shot. Save made by Shane Higgs. 26:21 Unfair challenge on David Ngog by Patrick Kisnorbo results in a free kick. Jay Spearing takes the free kick. 23:59 Luciano Becchio produces a right-footed shot from just outside the box that goes wide right of the goal. 20:14 Corner taken by Robert Snodgrass, clearance made by Sotirios Kyrgiakos. 18:31 Foul by Ryan Babel on Andy Hughes, free kick awarded. Andy Hughes takes the free kick. 17:28 Philipp Degen sends in a cross, Header by David Ngog from deep inside the penalty area misses to the right of the target. 17:05 The ball is swung over by Sotirios Kyrgiakos, clearance made by Jason Crowe. 16:42 Outswinging corner taken from the left by-line by Fabio Aurelio. 16:31 Shot by Jay Spearing. Patrick Kisnorbo gets a block in. 15:40 Jay Spearing produces a cross. 14:43 Michael Doyle has shot on goal from a long way out that goes wide left. 14:14 Inswinging corner taken left-footed by Robert Snodgrass from the right by-line, clearance made by Jamie Carragher. 13:33 Jay Spearing gives away a free kick for an unfair challenge on Luciano Becchio. Robert Snodgrass crosses the ball in from the free kick. 13:04 Centre by Andrea Dossena, Effort from inside the area by David Ngog misses to the left of the goal. 12:02 The assistant referee flags for offside against Luciano Becchio. Diego Cavalieri restarts play with the free kick. 11:18 Corner taken left-footed by Robert Snodgrass. 10:32 Header by Michael Doyle from deep inside the penalty area misses to the right of the target. 9:03 Unfair challenge on Robert Snodgrass by Andrea Dossena results in a free kick. Free kick taken by Shane Higgs. 5:46 Fabio Aurelio produces a cross, clearance by Lubomir Michalik. 5:12 Inswinging corner taken left-footed by Fabio Aurelio, save by Shane Higgs. 2:41 Jonathan Howson fouled by Philipp Degen, the ref awards a free kick. Shane Higgs takes the free kick. 1:55 The ball is crossed by Robert Snodgrass, Diego Cavalieri makes a save.